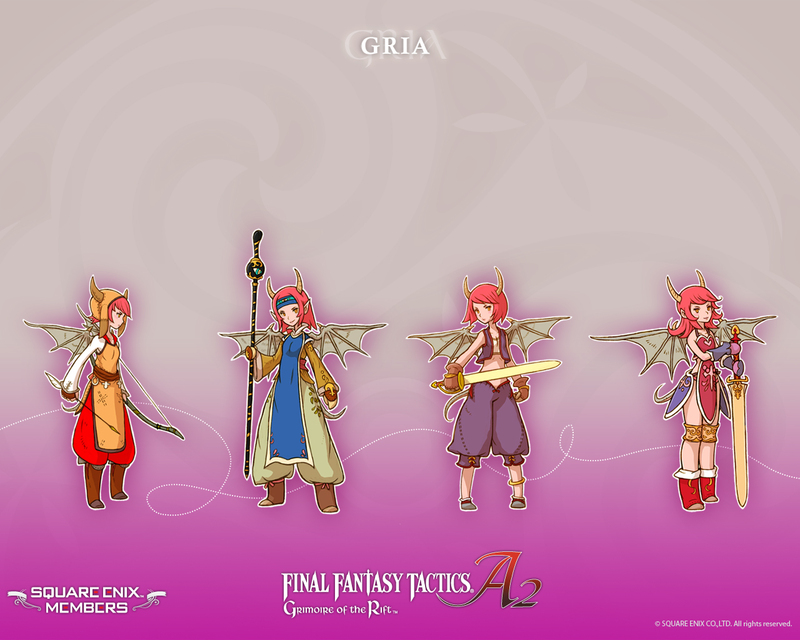 Final Fantasy Tactics A2 Grimoire of the Rift for the DS, better late than never. I won the game back in June from here and have played enough for my review. I've got to start by saying thanks again to Gouki.com for making me Jimmy of the Month back in June and hooking me up with another great game. This time around was even better. Not only did I get the copy of Final Fantasy Tactics A2 Grimoire of the Rift for this review, but I also have a copy of Dead or Alive 5 coming. This review has taken me forever for a few reasons. The first is that I'm not that big of a fan of the Nintendo DS, so it's my son's system I played it on. If it was on a real system this would have been done a long time ago. If you have ever played any of the Final Fantasy Tactics games you know that they are incredible. You can spend countless hours building a clan and doing all kinds of side quests. You have a few characters that have to join your team and and endless supply of others that you can recruit if you want. The story is that you are a kid who ends up sucked into Ivalice through a magic book. Sounds pretty familiar. He crash lands in the middle of a battle so you are forced to join the clan to survive. You have to battle your way around to fill the magic book (grimoire) to find your way back home. You encounter some odd characters as you play and there is a ton of time put on they main story. And even after you finish it you can keep going. You actually have to if you want to collect all the unique characters, such as Vann and Penelo. 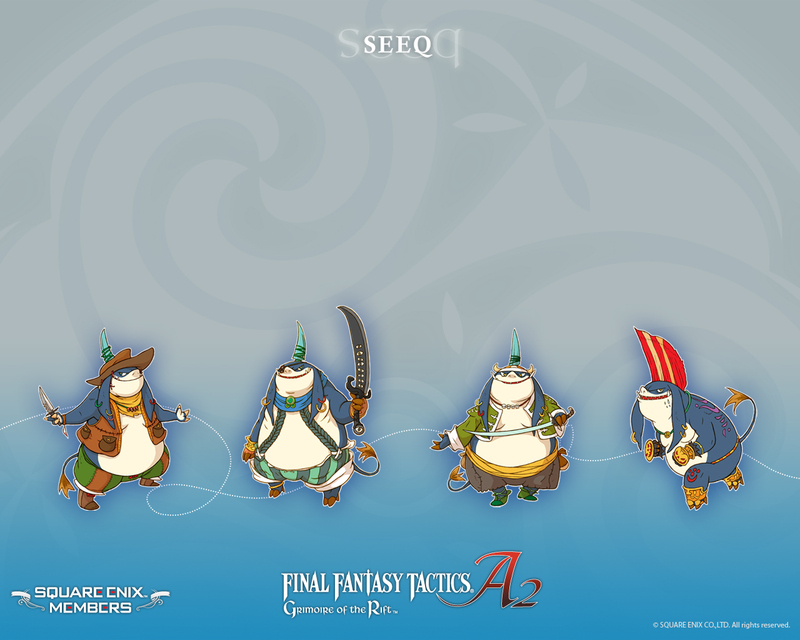 And in the above picture you see the Seeq from Final Fantasy 12 I think and they are playable for the first time. The Gria are entirely new. And if you have never played any of the Tactics games I should tell you it's a turn based RPG and you move across grids, think checkers. The stages you play in aren't exactly ground breaking but the are rendered pretty nicely. The music is also pretty standard and repetitive. There is no voice acting so be ready for a lot of reading, or skipping text if that's your thing. I've put in over 40 hours at this point and am still running around doing side quests so I'm not let down at all by the game. And my son loved the bonus. And now for the last character you can use. His name is Grant Alexander. He is a Georgia boy who has moved to California and is on the varsity football team when he realizes he's a mutant. As with the other characters you will be able to pick his base power and have it evolve as you play. But from what I've read the character selection is mostly about background and personality. You will have the option to basically have your character play however you want. So the the answer to almost all of your questions about how does the game play is it depends on how you play. Bowser's Inside Story, love it or hate it? Been playing this DS game, and frankly I'm sick of it. Alright. So I've been playing this game for a while, and don't get me wrong it's not a horrible game, but it is not at all what I was hoping for. I played both of the predecessors, and loved them, but I can't really stand this game. They said it's full of variety, but it's not. You spend most of the game playing as bowser. Which isn't bad at first, but after a while you get sick of him, and want to go back to the Mario and Luigi games you already know and love. The graphics are good. The comedy is what I've come to expect from this line of games and it's great. I just get sick of playing as bowser, just to play as mario and luigi for a few minutes to help out the bowser play. I don't know. I have two boss battles left and I've lost almost all of my momentum. I'm pretty sick of the game. Have you guys played this? Have you played the others? Did you like this one? Tell me why or why not. Opinion: Are RPGs Fit for Handheld Systems? My opinion on RPGs on handheld systems. So I've been playing Star Ocean: First Departure on the PSP. It's a good game - you can find my first impressions on here somewhere - but as I was playing it, I started thinking about RPGs on handhelds. Are RPGs really fit to be on handheld systems? I remember back when I was playing Pokemon on the Gameboy Color, It was great fun, and a huge part of the reason it was fun was because you could save anywhere, at any time, and pick the game up any time later and continue. Anyone who's an RPG gamer can probably relate to this frustration: Well, I stopped playing X for a couple of weeks, and now I have to start all over; I can't remember what was happening. 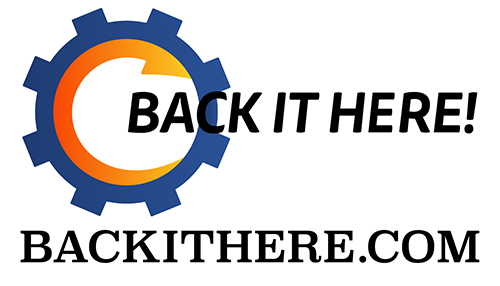 It can be the most frustrating thing in the world, and the frustration increases tenfold on a system that you may only pick up twice a month. RPGs are story-driven, and they require a high level of commitment in order to beat them. From my experience with people who play handhelds, they can't or won't give that sort of commitment to a handheld system. They want their DS or PSP for short spurts of fun while they're waiting for something else. If I look back to Pokemon, I remember being able to play that for a mere five minutes and turning it off; good times indeed. Then I look at First Departure, and I see a problem. I was in a dungeon, and I spent forty minutes in this one dungeon. The dungeon had exactly two save points throughout, and ironically both were placed near the tail end of the dungeon. Had I gotten halfway through the dungeon and then that something happened and I had to turn the PSP off, I would have been screwed. And if I was going to go a couple weeks before I turned my PSP back on, I'd be even more screwed. This isn't a problem that plauges First Departure exclusively, either. I went a whopping two weeks without playing Crisis Core, and I suddenly realized it was time to start over. Needless to say, in my frustration I decided to play something else instead. I really, really wanted to play Crisis Core, but the idea of starting over was revolting at best. I hope game designers can take a lesson from all of this. RPGs can be great on handheld systems so long as they're designed from the ground up as a handheld experience. Designers need to consider things such as distance between save points and lengths of time spend absent from the game. Once these two things are considered, maybe we'll end going full circle and getting a great handheld RPG that plays like Pokemon.